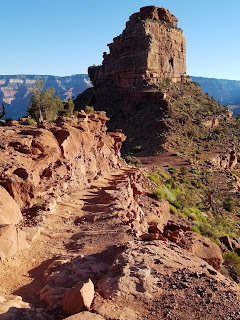 I recently completed the Grand Canyon Rim to Rim hike, in one day. It was an exceptional experience: physically demanding, mentally taxing, and aesthetically amazing. It's certainly not a hike for the unprepared; you risk anything from blister, to death, to being stranded for lack of transportation planning. The variable conditions make it impossible to make a one-size-fits-all guide, but here is my experience--hopefully you will learn from it. First, again, I cannot stress enough that doing this hike in one day is not something to do on a whim. For that matter, the National Park's Service directs us not to hike from rim to river and back, by any route, in one day. If you do this hike in one day, it is at your own risk. This post is not intended to be an authoritative guide to the Rim to Rim. I am not encouraging you to attempt the hike and, indeed, I second the NPS's direction to NOT attempt a rim-to-river-and-back hike and disclaim all liability from a Rim to Rim attempted after reading this. 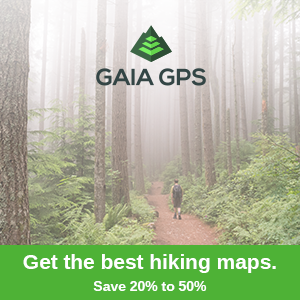 If you do this hike, it is at your own risk. You can see the ruts in the trail. Miles of this. As you can infer, we took the South Kaibab to North Kaibab route. After loading and unloading the bus, drive time, bathroom break, and photos, we finally got on the trail at 5:45 AM. You've probably read about how the South Kaibab trail is very exposed. That's true even around sun rise. Aside from a few moments at the beginning of South Kaibab we were in direct sun from rim to river. Luckily it was a cool morning and the sunshine was not a problem on our trip down. The trail itself was very rutted by hooves and hikers, creating miles of ridged steps that demand attention to ensure ankle safety. Otherwise, it was relatively smooth inasmuch as it was not particularly rocky. But it's still a tough hike of 7 miles, down hill. That's a beating for your knees. As far as facilities on the South Kaibab trail: there is restroom at the trail head, a second 1.5 miles in, and a third several miles later. 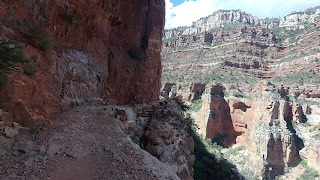 THERE IS NO WATER ON THE SOUTH KAIBAB TRAIL. After about three hours and almost 7 miles, we made it to the river. I've never been so glad to stop hiking down...picking your next step across that uneven footing was mentally exhausting. Bright Angel Campground, at the 7 mile mark, is the first available fresh water on this rim-to-rim route; followed very closely--about a half mile later--by Phantom Ranch. Phantom Ranch also has limited food and drink for sale, as well as post cards that indicate they were carried out by mule. Phantom Ranch served as our group's first reconnection point to make sure there were no stragglers. It's also the end of the trail being easy and breezy. The river! Bridge on the far right, Bright Angel Campground in the left-center. After Phantom Ranch--or really, the moment the river is at your back, it's all uphill. The incline is gradual at first, with about 2000' gained over the seven miles to Cottonwood Campground, and significant thereafter, with about 4200' gained over the next 7. Elevation chart over distance, according to my Fenix 3. Though the trail between Bright Angel Campground and Cottonwood Campground doesn't feel like a hard hike, it was a miserable section of trail due to the direct sun and heat reflected from the canyon itself. We made it through the dreaded Box before temperatures got too high, but it was still exhausting. Air temperatures reached mid-high eighties that day, combined with the sun it was miserable. Luckily, I had a long-sleeved shirt that kept the sun off my skin. Even better, there were a couple upwellings of cold spring water in the middle of the trail, in addition to multiple creek crossings. The trail itself couldn't feature smoother terrain without being paved. After seven miles in the sun, we arrived at Cottonwood Campground. As the name implies, it was shaded by cottonwood trees. A welcome relief, and the first water and toilet stop after Phantom Ranch. We filled up our water, ate a sandwich, wet our clothes, and after a very brief rest got back onto the trail. This is where the serious incline kicked in, and kicked in quickly. For the first several miles the sun remained unrelenting, but we lucked in to having a nice breeze to help cool us. The Manzinata Rest Area is 1.5 miles past Cottonwood Camp Ground. It also has water and toilets, but having just stopped at Cottonwood, we did not top off water and narrowly made it to the Supai Tunnel water without running dry. The 600' elevation gain in this 1.5 miles was a real wake-up call for what was to come. The next segment is a 600' elevation gain over .7 miles between Manzanita Campground and Ribbon Falls. Ribbon Falls is visible from the trail, and if you follow the spur trail you can actually hike to Ribbon Falls and its fresh water. We did not choose to do this, instead deciding to hold off for the Supai Tunnel water. Shade and flat never felt so great. Roaring Springs to Supai Tunnel is a three-mile stretch that gains about 1600' in elevation. The elevation gain in this segment is concentrated into a few sections of significant climbs. Meaning that between climbs are fairly flat stretches, shaded by the canyon walls. After an already long day of hiking the flats and shade here kept me from becoming defeated as my quads started to twinge with cramps. The climbs, though, were soul sapping; especially as they meandered back into the full sun in some of the most brutal stretches. That said, it was just a warm-up for the final haul. By the Supai Tunnel water stop I was nearly out of water and had been rationing more than I would have liked. Definitely glad I didn't carry a mere two liter bladder, and sort of wished I had topped off at Manzanita Campground. Despite having only 1.7 miles of shaded hike left, I took at least two liters of water to help ward off the revisiting cramps and to keep my water intake up. By this point I was feeling quite exhausted and sort of overheated so I was taking no chances with hydration. I also re-wet my hat and cooling towel to keep comfortable. long. It was in this stretch that we began to see people in casual clothes with little water bottles; like seagulls near shore, they signaled our trip was nearing an end. Before long, we spotted a break in the trees, more signage, and finally a few steps that took us to the trailhead and parking lot. We made it! 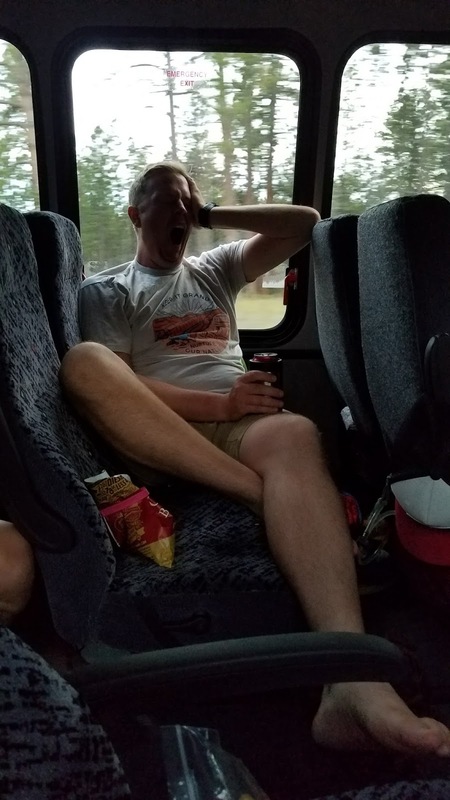 An unwelcome surprise, however, was learning that our shuttle bus was larger than permitted to wait in the parking lot, so with no way to communicate with the driver we sat and waited, hoping to be picked up and reunited with our carefully picked snacks to celebrate. So keep in mind maximum vehicle lengths (I think it was 20', but if you're concerned you should call the park to verify). Soon enough, our driver came over to see if anyone was up. We loaded on the bus and were taken to the North Rim Lodge. I have never expected the North Rim to be much different from the South Rim for scenery...I could not have been more wrong. The higher elevation gives a unique vantage, looking down on the south rim, the plateau behind it, and Mt. Humphreys in the distance. It's easily the best place to view the canyon. View from the North Rim Lodge foyer. Leather couches, cocktails, views. 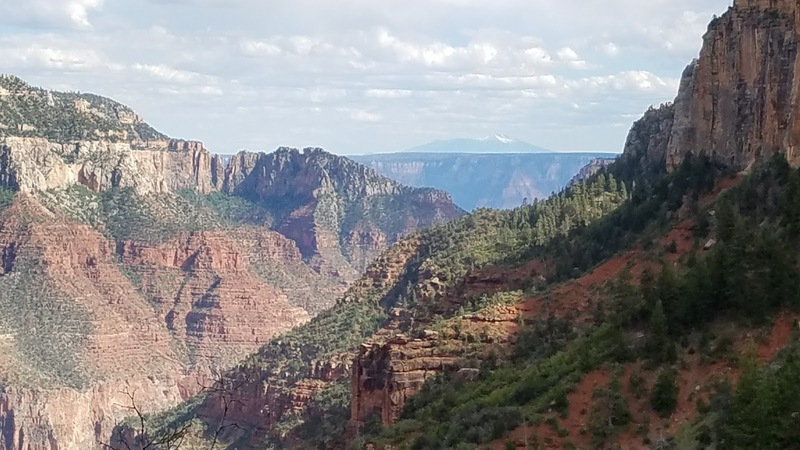 This year we were lucky enough to be invited along with the Barrow Neurological Institute's 34th (and final) Dr. Spetzler Rim-to-Rim hike on May 21st. Thankfully for us, that meant much of the planning and logistics were already taken care of. 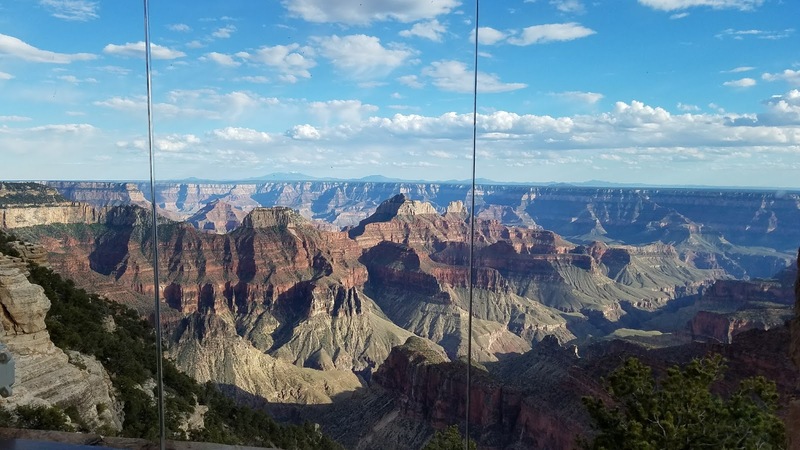 The group has arranged for a bus to drive us to the canyon, drop us off at the Hiker's Express bus stop, and pick us up from the North Rim to ferry us back to Phoenix. 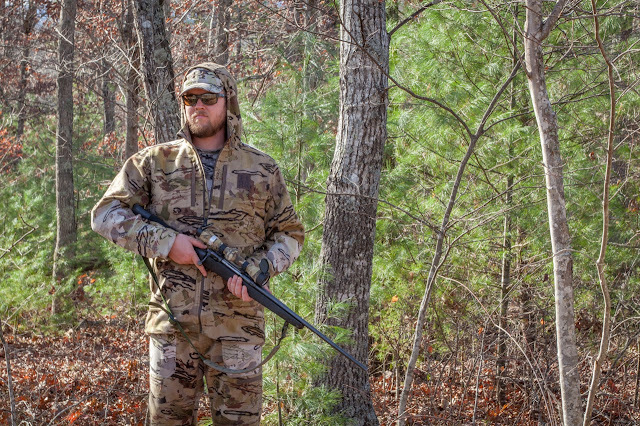 We just had to show up with checks in hand and gear in tow. 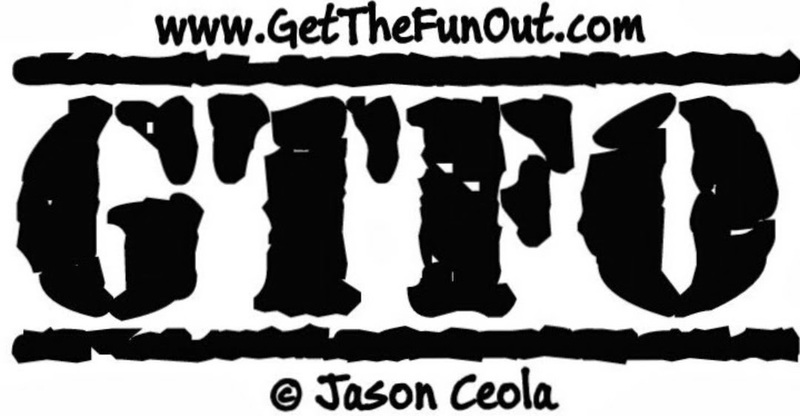 Unless you're lucky enough to be part of a similarly planned group, you'll need to get yourself there and, more important, figure out how to get yourself back. There is a shuttle service that will transport you between rims for $90 one way. You could also arrange a key-exchange with opposite-direction hikers and swap car keys when you pass, each taking the other's car from your destination rims. With our hike taking place on Sunday, we drove up to the South Rim on Saturday and had a night at the Yavapai Lodge. It was a convenient and comfortable jumping-off point for our hike the next morning. Lodging is also available outside of the park for those who might want to price-shop. Camp sites are less expensive option. You'll find various suggestions and, like many training plans, there's probably no one-size-fits-all program. Our training started in January. We regularly hiked, making sure to get in both distance and elevation gain; but not necessarily both in the same hike every time. We wanted to replicate as much of the experience as we could, and wanted to put our gear through long days on the trail to see what worked and what didn't. The longest training hike we did was around 12.5 miles, 6 hours, and 3000' elevation gain. Despite being only half of the Rim to Rim, it was still a good test run. In addition to hikes, we ran, mountain biked, did weekly yoga, walked daily, and did some occasional strength training. I felt like we slacked on our training compared to what we planned; but still maintained a lot of activity. The two areas I wish I had focused on more were leg strength/endurance, and cardio. I was able to rocket through the downhill to Cottonwood Campground, but once the real uphill started I started to get winded then start to cramp after a while. As an aside, as a New Years resolution I stopped eating meat, eggs, fish, and most dairy, in favor of a plant-based diet. Even as a vegetarian, though, I felt plenty strong and energetic for this hike. And the 20 pounds I lost along the way certainly didn't hurt anything. Water/water receptacle - I used a 3 liter bag for my main supply and carried a .5 liter Platypus flask for mixing electrolyte tabs. Some sites have said with the frequency of water stops you can carry a 2l bag and save some weight, but I would have run dry more than once with only 2l. Water is available along the Bright Angel and North Kaibab trails, but check ahead of time to ensure it is running. A rock slide weeks before our hike knocked out water on the North Kaibab trail, but luckily the pipeline was repaired by the time we hiked. As of posting, this site included a link to water status. Electrolyte tabs/salt packets - many people don't realize that salt is actually essential to staying hydrated. 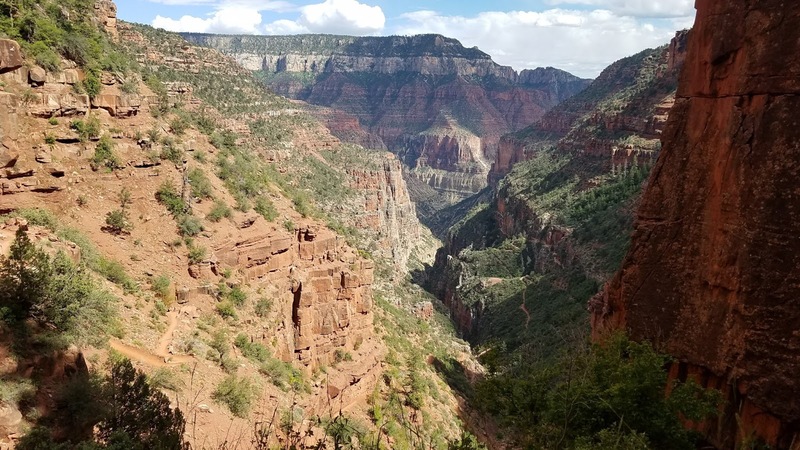 In the Canyon, because you lose salt to sweat due to heat and exertion, and typically replace it with regular fresh water, lack of sodium (hyponatremia) can be a deadly condition. I used Nuun tabs and consumed approximately 5; though it could be as simple as salt packets from McDonald's. Food - you'll burn serious calories. According to Outdoors.org's estimates, you could expect to burn an extra 5,000 calories hiking, in addition to your basal metabolic rate. You will want to replace those calories or you won't be making it out. Snack decisions are somewhat personal, but a good combo of quick burning carbs, with proteins and fats, should keep you happy. I took several PB&J&Hazelnut Spread sandwiches on Dave's Killer Bread, a multitude of Cliff Bars, and several shot blocks and energy jelly beans. Comfortable shoes - I wore Nike Wildhorse 4 trail running shoes. Most, perhaps all, of our group wore trail runners or low hiking shoes. The trail was not uneven enough to warrant boots, in my opinion and the comfort of Nike Air made my feet the only things to come out of the hike feeling unused. DO NOT wear a brand new pair of shoes for the first time on this hike. 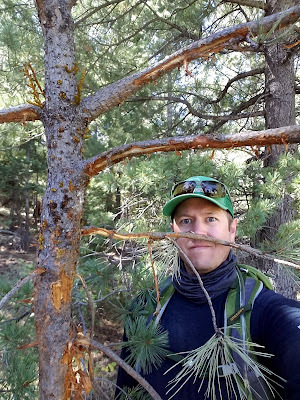 Trekking poles - you don't have to have them, but man do they make the trip easier by letting you propel yourself with all four limbs. Using Nordic Walking techniques (remember the arm motion from Nordic Trac machine? It's similar.). You can take some of the work off your legs. This saved me when my quads started cramping with several miles to go. Trekking poles can be quite expensive, but you can find them seasonally at Costco for around $30. Wide-brimmed hat (I like the Outdoor Research Sombriolet), cooling towel, and/or Buff. You'll probably hike for hours in direct, unrelenting, sun. Keeping it off your skin is can be a literal life-saver. Also, you'll have many opportunities to dip a Buff, cooling towel, and your shirt into water along the way--I suggest you take it. A loose, long-sleeved cotton shirt. Again, the sun is brutal. A loose cotton shirt will actually keep you cooler in direct sun by keeping it off your skin while allowing for air circulation. (Arabs wear robes for this reason.) It's also another item that you can soak in the cold water for a recharge. Gaiters - trail running gaiters like these Sparkplug Gaiters from Outdoor Research are so lightweight as to be practically unnoticeable, except for the fact that you won't be picking pebbles from your shoes at every rest stop. A comfortable backpack. Whatever works for you is best...you do not want to wear a brand new, untested backpack on this hike. Camera - for obvious reasons. Rim to Rim.org - everything from guides to trip journals to t-shirts.